A very distant shot of a very small beacon does not make for prize-winning photograph! 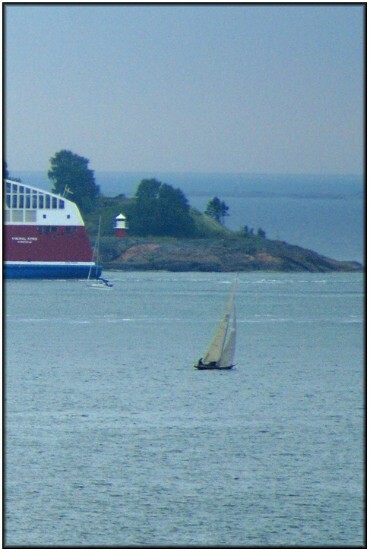 And I believe this is probably the most distant shot that I took in the course of this short visit to Helsinki. I had used the name for this beacon given in Alex Trabas's Online List of Lights and had set up the page and the relevant links before I realised that Remmarholmen is the Swedish name and that the Finnish name, unless I am wildly off my linguistic track, should be "Reimarisaari". The stern of the ship rapidly disappearing out of the left of shot belongs to the Viking Lines ferry Viking XPRES inward for Helsinki from Tallinn in Estonia.